The Pi Saw unlike the Klui is made from a long and slender piece of bamboo. The actual length of this instrument can vary depending on the pitch desired. Some musicians can carry a set of 5 to 7 instruments. The smallest size of the Pi Saw is about 45 cm in length while the largest can be up to 80 cm. Being basically a long piece of bamboo the instrument is fairly easy to construct. A piece of bamboo is selected of the right length and the obstructing sections are hollowed through so as to make one long tube. In the head ( the mouth piece end of the flute) is inserted a piece of metal reed made of brass or silver. Similar in design to that of a mouth organ. The tube has seven finger holes. The holes are bored into the tube slanting toward the head end. The instrument is played in a similar fashion to the flute or picolo. However as explained above the instrument has a reed which produces the tone as opposed to the mouth piece of the flute which has a hollow mouth piece. 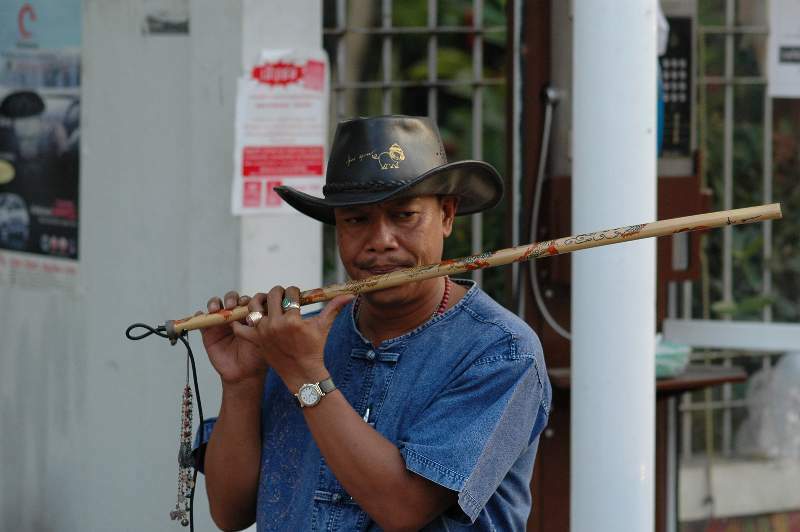 This picture of a Northern Thai musician has an amplification device also fitted at the head end. Like the Seung and Sa lor this is a Northern thai instrument and is usually used to play folk songs and traditional ballads.